Google Pixel XL review | What Hi-Fi? For years, Google has employed other mobile brands – LG, Motorola and HTC to name but three – to help design and manufacture its Nexus smartphones and tablets. But the time has come for the global tech giant to go it alone with two new smartphones: the new Pixel and the bigger and (supposedly) better Google Pixel XL. Or at least, that’s what its ‘Made by Google inside and out’ strap line would have you believe. In fact, although the Pixels sport Google’s branding on the back (unlike the Nexus devices), the brand hasn’t erected its own smartphone-manufacturing factory overnight, for it’s actually HTC behind the Pixels’ hardware. However, everything from the handsets’ industrial design to the user experience is Google’s own doing, making the Pixels the first true bona fide ‘Google phones’. There’ll be no more Nexus, by the way. The line has been usurped by Pixel. But the Pixels aren’t merely a more Google-heavy replacement. Whereas the Nexus’ offered premium, flagship-worthy specs at a slightly lower price than the top-dollar Apple iPhone, Samsung Galaxy and LG G handsets, the Pixels have decided to rub shoulders with the giants of the mobile world. Their price speaks volumes: the cheapest 32GB Pixel handset is £600, and the most expensive 128GB Pixel XL is £820. Yes, that’s some serious cash. Trying to muscle in at the top is a tall order for any newcomer. Considering the market leaders are the long-established Apple and Samsung, even a company with the resources and reputation of Google enters as an underdog. To stand out in such company, Google has to offer something different. Not only are the Pixels the only smartphones with the company’s new virtual personal assistant service, Google Assistant, but Pixel users also get free, unlimited cloud storage for photos and videos. Ironically, considering the name (‘Pixel’ is now a product series that includes the Pixel C tablet and Chromebook laptops), the Pixels don’t have the industry-leading Ultra HD screen (3840 x 2160) heralded by the likes of the Sony Xperia Z5 Premium. While the standard Pixel has a modest 5in Full HD AMOLED screen, the Pixel XL takes up where the Nexus line left off (in the 6P model), featuring a Gorilla Glass 4-protected AMOLED screen with a resolution of 2560 x 1440 – or QHD (Quad High Definition) as the industry has coined it. It’s a healthy 5.5in; sharp and bright with a refined colour palette and penchant for nuanced detail. The Pixel XL is neither pixels nor quality away from the LG G5. Lines are concise and contrast punchy, and while it doesn’t quite have the Samsung Galaxy S7’s eager vibrancy and high contrast, it’s hardly a washout either. The ‘XL’ part of the name holds more relevance. Dimensions-wise, it sits comfortably between the Samsung Galaxy S7 and iPhone 6 Plus – an XXL version would cross into ‘phablet’ territory – but the curvaceous corners of its aluminium unibody and the subtle wedge around its side panel help with ergonomics. The Google Pixel XL's relative slimness means it can be operated one-handed, and the fact that everything – the buttons, the fingerprint scanner and camera lenses – is flush or inset means there’s no bumps or bulges to contend with. It’s every bit the sleek and trim construction we’d expect of a smartphone this pricey, and that’s only helped by the glass panel on the back where the Pixel Imprint fingerprint scanner sits, and the classic choice of colour finishes: ‘Quite Black’ (apparently to Google, that’s grey) and a more decisive ‘Very Silver’. No matter how nice, it probably shouldn’t accompany you in the shower. With an IP53 waterproof, it’s only safe from slight water spray – officially ‘spray at any angle up to 60 degrees from the vertical’. In other words, buy a case or try not to get it too wet. You don’t even have to browse for one online. Just ask the Pixel to do it via Google Assistant, essentially a more conversation-based extension of Google Now. Out to rival Apple’s Siri, Microsoft’s Cortana and Amazon’s Alexa, Google Assistant lacks a personal nickname, which is a missed trick in our opinion. For now, Google Assistant is exclusive to the Pixels and other Google products like the Home wireless wi-fi speaker, although we’d be surprised if this didn’t turn out to be windowed exclusivity. A long press of the home button, or the utterance of “OK Google” (even when the phone is locked), launches the service, and any voiced interaction is presented in a chat layout. You know the drill; ask a question and it recites the most relevant answer on Google. Ask it to open Spotify and play a tune, WhatsApp a friend, or take a selfie, and it obliges. More impressive is the Assistant’s willing to keep chatting. For example, ask ‘what is the weather tomorrow?’ and underneath the answer, Google second-guesses your next question with ‘what about the weekend?’ Ask it the time and it’ll also give you the option to set a timer or alarm. That’s not all that makes the Pixels special. Users can wave goodbye to wretched ‘storage is full’ notifications as they’re entitled to unlimited cloud storage for videos and photos, which is good as Google has packed performance into the Pixel XL’s snapper. The front camera snaps at 8MP and records in 1080p, the rear 12.3MP and 4K/60fps. On paper, that’s similar to the Nexus 6P (albeit that could only shoot 4K at 30fps). It also features an improved and instant version of the HDR+ multi-image capability built into some Nexus models, and the results are impressive. With HDR+ activated, the camera combines several images in real time to produce one photo with less noise and better dynamic range. It manages to combat the discrepancies in lighting and dig up detail in every area of the shot. While we find its detail and clarity preservation in dark conditions most impressive, daylight shots are just as pleasing: crisp, detailed and brimming with subtle colour tones. Even with the zoom stretched there’s very little discernible noise. Snapping feels instant, with rapid shutter speed and no autofocus lag. Video stabilisation is one of the camera’s most valuable bits of software. The effect can sometimes look overdone, but generally it does a good job of eliminating judder and smoothing out action clips. Of course, Pixel XL users also have the wider all-inclusive Google terrain to tread. 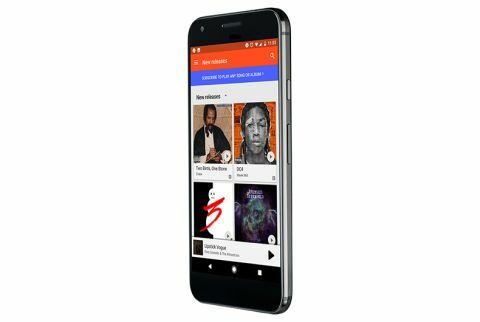 While Google is buried away working on Android-Chrome hybrid operating system ‘Andromeda’, the Pixels stick to the familiar Android format and are the first to show off the latest 7.1 Nougat version. Using the Pixel XL is as pure an Android experience as you’ll get; there’s no second skin layer applied over the top as with so many other Android-powered devices, instead the interface is stripped-back, bloatware-free Android, and all the cleaner and more intuitive for it. Thanks to the Qualcomm Snapdragon 821 processor, the Pixel XL is clutter-free, and speedy. Everything from screen responsiveness to launching apps and performing tasks is prompt. Fast charging means the 3450mAh battery can be topped up for seven hours of use in just 15mins (through the USB-C connection). Like the Marshmallow Android version before it, Nougat is as sweet an operation as you could wish for. Of the new features here, the most useful is split-screen – by dragging an app on top of another in the recent app menu, you can keep on top of messages and emails while following directions on Google Maps or video calling your mum, or don’t have to interrupt your live video stream of the football. A new ‘Night Mode’ tints the screen amber for easier reading in dim light; the Google Keyboard now supports GIFs; and Google Doze, the battery-saving idle mode launched as part of Marshmallow now works on the go and not just when you’re stationary. It also promises even more effective power saving. While there’s still a pull-down toggle notification bar for accessing shortcuts, the app drawer is now summoned by a swipe up on the home page. Pop-up notifications from the same apps are now bundled together, and there’s now an option to reply directly to messages within the notification window without having to launch the app. A quick tap of the Google logo on a homepage launches a pop-up search for speedier web surfing too. There are also three shortcuts that Google calls ‘move gestures’: swiping your finger down the sensor pulls down the notification bar; a double tap of the power button launches the camera; and twisting the phone swaps between front and rear cameras. Google has also introduced long-press shortcuts – a spin on the 3D Touch that was brought to Apple devices in iOS9 – available for most Google apps. It’s all about getting more options from fewer presses; holding down Messenger, for example, brings up recent conversations without having to launch the app. You can compose a message directly from holding down the Gmail icon, or choose whether to set an alarm or timer by doing the same with the clock one too. But when it comes to sound, it’s like Google’s engineers ran out of steam; there’s no hi-res audio support and the sound quality is nothing special. We plug a pair of B&W P5 S2s into the 3.5mm headphone port located at the top and instantly find a smooth, tonally even sound, with enough body to prevent it sounding thin or shrill. Play Chromatic’s Ceremony and the presentation is as lax as the shimmering synths rippling calmly behind the guitar. But you don’t need a particularly upbeat song to know that something’s missing. The Apple iPhone 7 and even the Samsung Galaxy S7 throw more drive and conviction behind the track’s guitars, making the Pixel sound soft and restrained in comparison. The two rivals are clearer and more insightful too, providing greater space for the electronica to evolve around the vocal, and surfacing enough subtlety to communicate the discrepancies between each guitar twang. Through the Pixel, there’s not really much in the way of dynamic activity to get across the interest or emotion in the recording, and as a result it sounds a bit flat. It’s alright, but sadly that’s about as emphatic as we can sound. Thankfully for Google’s mobile team, that’s a million miles from how we generally hold the Pixel XL in regard. The uncompetitive sound quality and lack of sufficient waterproofing is a shame, but usability and innovation is high on the list of pros. The organic Android experience, now slicker and more user friendly than ever, is a joy to use, and with Google Assistant, its future looks bright indeed. But it all boils down to the million-dollar question: is that enough to tear people away from LG, Samsung or perhaps even Apple? We aren’t convinced.